Find out what to do in Cortina, the Queen of the Dolomites! Just like emotions have no need of words, the Queen of the Dolomites has no need of a complicated presentation, just one sentence will do, uttered by countless visitors to the Dolomites: “Cortina is the most beautiful place in the world!”. The only place in Italy to feature on the Best of the Alps list, Cortina d’Ampezzo is a natural paradise where the magnificent Dolomites World Heritage Site is the breath-taking backdrop to an unforgettable holiday. It’s all here, sport, culture, shopping and fine dining, everything needed for a life-enhancing break, with the family, with friends, or a romantic tryst for two. Set among the Dolomites’ most majestic peaks, Tofane, Cinque Torri, Cristallo, Pomagagnon, Antelao and the pristine natural landscape of the Dolomiti d’Ampezzo Nature Park, Cortina is full of surprises, combining the traditional Alpine identity with the glamour of an international holiday playground. Two personalities in a single location, unique in the world. On the one hand the silence of the mountains, on the other intellectual conversation in art galleries. By day, donning sturdy ski or hiking boots, by night, teetering on impossibly high heels. Traditional mountain living spiced up with today’s high-fashion lifestyle. 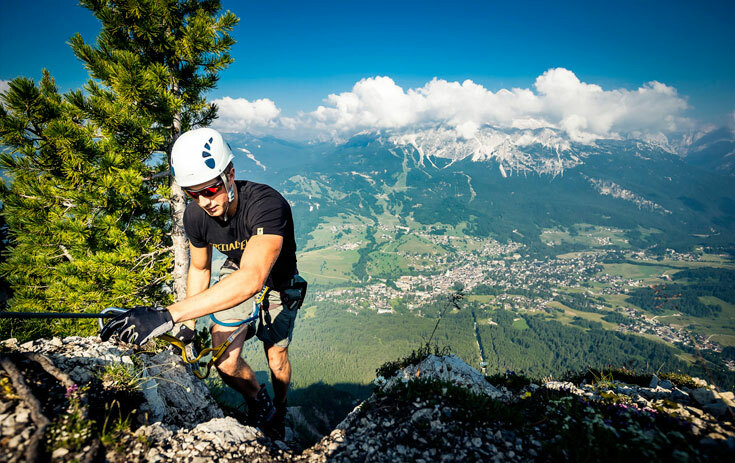 When the sun-kissed Ampezzo Valley turns green, it’s time to get out the bike, hiking boots and climbing gear. 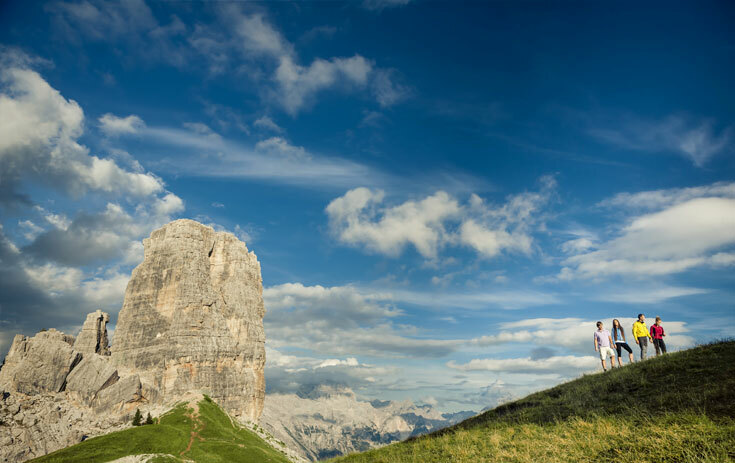 Summertime Cortina d’Ampezzo is a fabulous natural gym within everyone’s reach: gentle rambles up to waterfalls and Alpine lakes, vie ferrate, kilometres of vertical climbing walls, mountain bike trails and those world-famous Dolomite passes for road bikes. One of Europe’s most scenic cycling trails, La Lunga Via delle Dolomiti, runs through Cortina. While the summer days may be long, there’s never time to get bored, with the Adventure Park offering heart-stopping thrills suspended in mid-air among the trees, the Bike Park for downhill racers, a game of golf or tennis, a walk among the trenches and forts of the Great War Open Air Museum, a yoga lesson at dawn, a delicious snack made from local products in a mountain refuge. If however, your idea of an action-packed holiday consists of stretching out in the sun on a scenic mountainside terrace, no worries, the ski lifts stay open in summer to whisk you effortlessly to one of those mountain refuges with breath-taking views to enjoy as you work on that tan. The Dolomites al fresco will fill you with energy and a sense of wellbeing. As a ski resort, Cortina d’Ampezzo is one of a kind. With 115km of pistes with various levels of difficulty, always with perfect snow-cover provided by state-of-the-art snow machines, this is one of the largest skiing areas in the Dolomiti Superski complex. 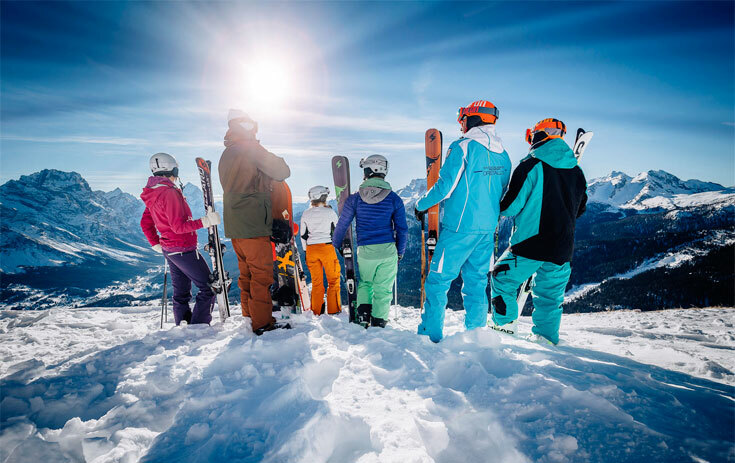 Thrilling ski tours, like Super 8, await you, as does the Snow Park for snowboarders and freestylers, off-piste skiing on Freeride trails, children’s pistes and superbly equipped ski schools for fun lessons with instructors fully qualified in all the snow sports. Then there are the gourmet refuges in breath-taking settings and naturally, plenty of après-ski fun after a hard day on the pistes. Cortina is much more than just a classic ski resort, winter resort is a better name because of all the other wintertime attractions. Countless kilometres of cross-country ski trails, ski-mountaineering routes and expeditions on snow-shoes exploring all those magical little places off the beaten track. Enjoy a second childhood on a downhill sled run, or try ice trekking, skating, snow-kiting, ice-karting, fat-biking and if you have anything else in mind, you can do it in Cortina as keeping up with the latest trends is an imperative here! After a day of thrills and hopefully not too many spills, here are some must-do suggestions: an aperitif in a stylish bar, a stroll in the centre among the fashion boutiques of the Corso Italia and the fascinating arts and crafts shops selling highly original wares backed by centuries of traditional artisan knowledge and skills. You can take dinner in one of the many restaurants or refuges, the latter reached in the winter by motor-sleds, rounded off by sledding under the stars for a very special evening. If you’re after something completely different, try the high-altitude spa with the highest Finnish sauna in the Dolomites and the barrel bath hot tub with a view over the Cinque Torri peaks - an oasis of wellbeing set in the majestic Dolomite landscape. Cortina buzzes with events, both in summer and winter, to make your holiday even more special, from mountainside concerts, to cultural festivals, from themed dinners to major sporting events. Cortina d’Ampezzo is rightly named the lifestyle resort, where you can savour the luxury of real me-time.